We were out in the agricultural hills of central Kanagawa prefecture a couple of weeks ago, and stopped off at the 90 year old home of the Hekkoro / Gonbachi restaurant. It’s an old style wooden Japanese farm house, old wooden floors, a casual table layout, and the back is adorned with artwork from local art classes, mainly from children. Aside from serving some very decent food using local vegetables and making dishes from noodles to curry, it also allows you to read some of the books they have, and even do some shodou (書道 /calligraphy), which a couple of junior high school kids did actually do whilst we were there. 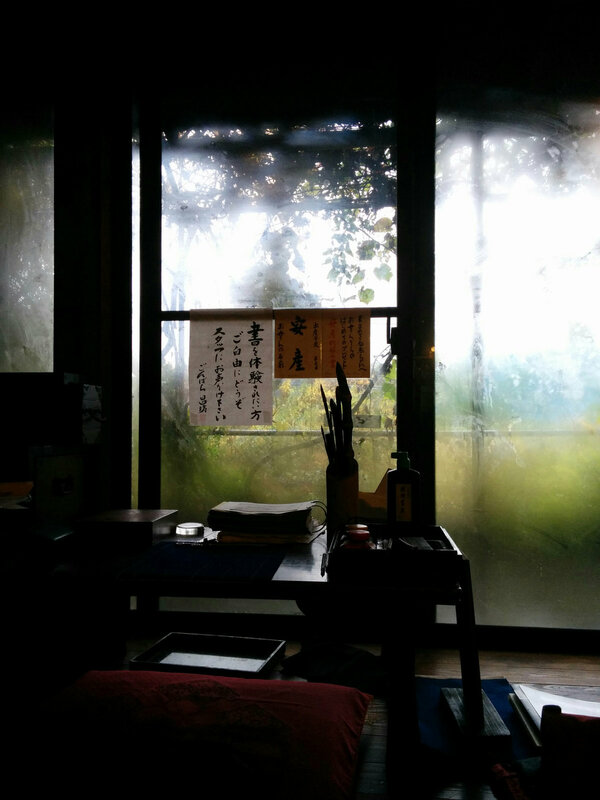 On the day we went it was raining, and as you can see, the condensation on the doors to the garden was a relaxing backdrop to the calligraphy table.